The main purpose of the book is to help those preparing for entrance examinations to engineering colleges in revisiing the high-school physics course and in further studies at the college. The fourth edition of the book came out in 1981. Amendments to the physics curriculum at the high-school and polytechnic level have been incorporated as well as extra material on other branches of the physics course. The 6Eth edition was prepared by taking into account the modified style of problems set at the entrance examinations. Each section begins with a brief description of the basic theory, physical laws, and formulas. This is followed by worked problems and a few descriptive problems. Exercises and questions for revision are givena at the end of each section. The problems are solved according to the unified and optimal approach described in the introduction. By solving the problems, students will acquire a firm theoretical background and knowledge which will help them in their work in whichever sector of the economy they will be employed. The appendices contain tables required for solving problems, SI units of physical quantities. And the rules for approximate calculations. In addition to the problems composed by the autbors this book also includes a selection of problems set for the aptitude tests and entrance examination in physics at the N.E. Buaman Higher Technical School and other technical institutios in Moscow. Intended for students of preparatory courses at engineering colleges, this book can also be used by high-school students, students of intermediate colleges, and those interested in self-education. The author is indebted to Prof. A.N. Remizov and Asst. Prof. N .V. Tygliyan for their enormous help in preparing the manuscript for publication. The book was translated from the Russian by Natalia Wadhwa and was first published by Mir in 1990. All credits to the original uploader. 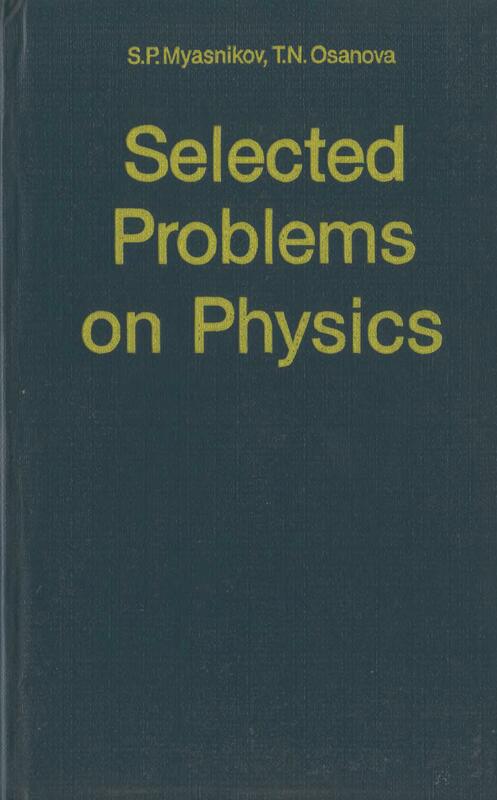 This entry was posted in books, engineering, mir books, mir publishers, physics, problem books, science and tagged atomic nuclei, atoms, currents, diffraction, dynamics, electricity, electrstatics, gas theory, gases, geometrical optics, kinetmatics, mechanics, optics, oscillations and waves, problems and solutions, refraction, statics, thermodynamics. Bookmark the permalink.